Do you know what’s just around the corner? FALL! My favorite season of the entire year (most likely my affinity for leaf canes). This project is much easier than it looks. All you need are a few simple supplies and some complimentary leaf canes. Though all my canes are different, the match and look great together. Here’s why: I used one color for the center veins and for the outside on each cane. This will help your leaf canes naturally look like they match, especially if you’re making sinner blended canes. Don’t know how to make leaf canes? CLICK HERE for several tutorials & projects using leaf canes. Add your “secure leaves” – These are the leaves that will envelope your brass and hold it firmly in place. You will likely need at least 3 if not 4. Now continue adding your caned leaves in any arrangement you find pleasing to your eye. String on any stringing material of your choice with beads and extra caned leaves. NOTE: I strung mine on brown cording with gorgeous brown wooden beads alongside my leaf cane charms. 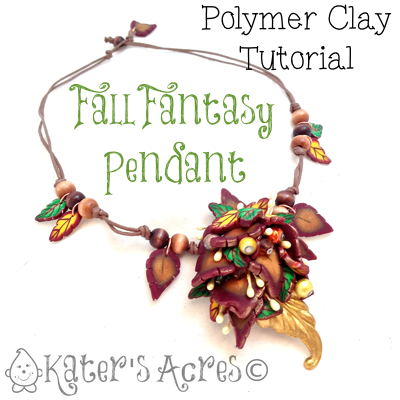 Free polymer clay tutorials are made possible by Whimsical Sculpting Tutorials Club Members. Previous post: What Can YOU Make with These Polymer Clay Supplies?